Today has been a whirlwind, but thankfully I kept a notepad on me for keeping track of everything. Followers of my personal accounts on social media have probably seen by now that our favourite little pup was successfully admitted for surgery to prepare her broken leg and that the surgery went well! 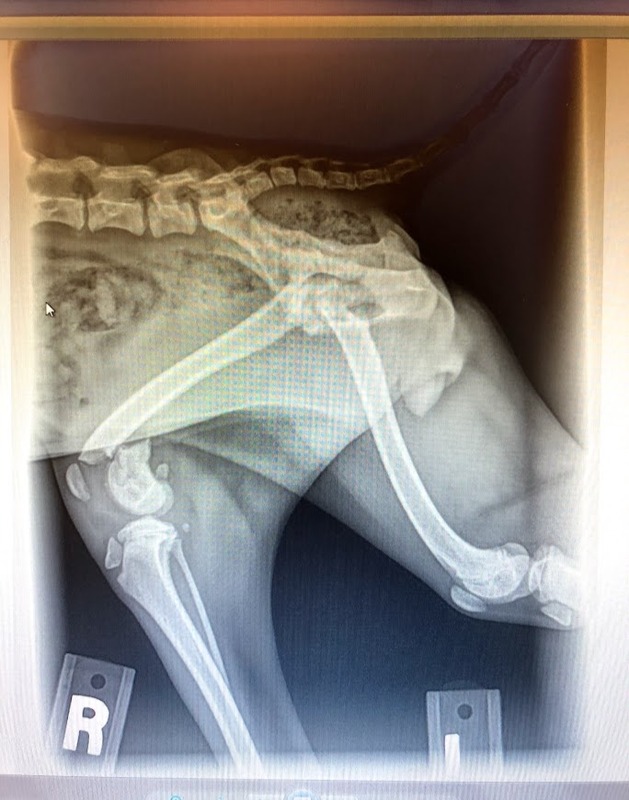 She was admitted to the clinic after we consulted with the orthopaedic specialist about her x-rays and discussed best courses of action and what to expect both during recovery and long-term, as well as potential risks based on what we knew at the time. He called me this evening after she was moved to post-op, to talk about how the surgery went and next steps. Currently, the nugget is staying overnight at the clinic, and I should be able to pick her up tomorrow. In examining the x-rays, our doctor pointed out that the growth plates on the bone were intact. If they had been damaged, there would be a high risk that her tiny puppy bones would not grow properly. So yay growth plates! He also relayed that her bloodwork came back good; this isn’t necessarily something we were worried about but I’ll take every bit of good health we can get from the pup! I’ll know more about the long-term expectations by the end of today (Wednesday), but overall the prognosis is good. I should be picking her up around 4:30 pm and we’ll have a follow-up appointment in a week. After leaving the surgical clinic, foster mom and dog auntie Brandee and I drove around running errands to prepare for the upcoming weeks of recovery time. Thankfully Brandee and I make a great team, and have been keeping each other level-headed through this experience! We hit two pet stores and gathered up a laundry list of items for the nugget, including crates, pet beds, and some grooming and comfort supplies. We even found a nice wearable dog carrier, like a backpack you wear on your chest, which I’m expecting will get a lot of use during the upcoming weeks of no running/jumping and limited walk/play time (the baby gates I mentioned in my last update got set up as well). It’s gonna be tough but I think we’re just about ready! A little bit more official business before I get some sleep: in my last post I also expressed concern about GoFundMe funds transferring to my bank account in time for her admittance to the surgery center. I’m pleased to report that the initial transfer of $3,365.96, which I think is about what we raised in just the first 48 hours of this campaign, was available in my account by the time it was needed. THANK YOU. I cannot stress how relieving that was to see! It’s because of you guys that we actually were able to get her into surgery today and begin her road to recovery. Wow. Can’t wait to see my baby tomorrow!